On Scene: Think Pink, Fight Hard! 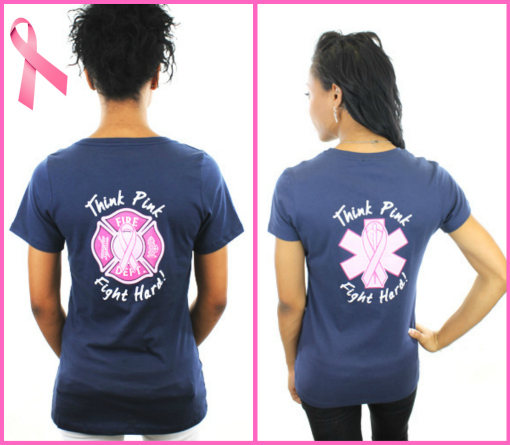 October is Breast Cancer Awareness Month and TheFireStore wants to honor that. According to breastcancer.org, in 2010 an estimated 207,090 new cases of invasive breast cancer were expected to be diagnosed in women in the U.S., and 54,010 new cases of non-invasive breast cancer. Breast cancer is a serious battle, and in 2010 there were 2.5 million amazing breast cancer survivors in the U.S.
TheFireStore has come up with an Exclusive Limited Edition Think Pink, Fight Hard Breast Cancer Awareness Tee that features either a pink Maltese Cross or a pink Star of Life so you can show your pride, love and support all in one. This super soft, 100% jersey knit cotton top features the one-of-a-kind design on the back, leaving the front as a blank canvas for you to customize by adding your name or department name. This baby jersey knit top is available in crew or v-neck, and is a great way to show your support since $3 from every tee purchase is donated to the Susan G. Komen for the Cure organization. So, be sure to check out our Limited Edition tee's and show your support for Breast Cancer Awareness. To see all the rest of our Breast Cancer Awareness products, click here.